Earlier today, Amir Khan announced that his new trainer will be Virgil Hunter. Hunter trains one of the best P4P fighters in the sport, unbeaten, Andre Ward. 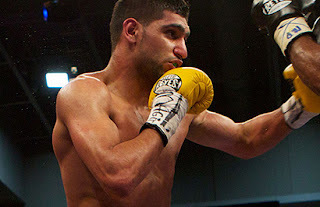 Khan also announced that his next fight will be in December, against unbeaten Lightweight, Carlos Molina. First let's talk about his new trainer. Obviously it can only be a good thing to have Virgil Hunter as your trainer. But in my opinion, the problem for Khan wasn't his old trainer (Freddie Roach), the problem was his mindset of standing in the middle of the ring and trading with a power puncher. Freddie Roach said in an interview that he doesn't think it's possible to change Amir's mindset. Roach will know Khan better than anyone, if he says that about Khan, it's hard to disagree with him. Also, Khan said he didn't like being 'second best' to Manny Pacquiao in training. Well, now he's going to have to put up with being 'second best' to Andre Ward. Now to Khan's opponent, yesterday I wrote a post on the rumours of a potential Khan/McCloskey rematch. I said that fight would be a pointless fight, well it looks like I'm going to be saying the same thing in this post. Molina isn't a big puncher, and is a Lightweight, this means that if he can't win most of the rounds against Khan, then he probably won't win the fight. This match-up is so poor that I would rather see Amir rematch McCloskey. But, you can't blame his team for taking an 'easy' opponent. One more loss for Khan and his career is in tatters. What's your take on Amir Khan's new trainer Virgil Hunter, and his new opponent Carlos Molina?